If you want to take a shot, you will need to submit a proposal outlining how you will transform your desired location into a tourist destination. Preference is being given to individuals under 40 years of age, although those of us over 40 are not excluded from applying. You don't actually get title to the building, sorry. You will have the right to run it for nine years, with an option for an additional nine years. The deadline to submit your proposal is June 26, 2017. 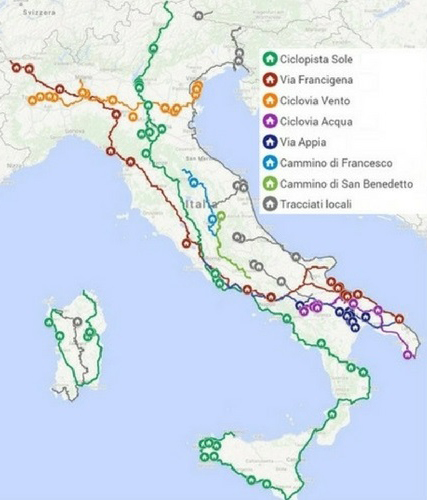 It is expected that work will begin next summer. 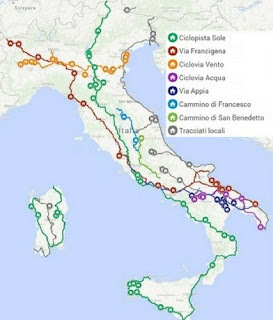 For more information (all in Italian, although the top of the page proclaims "English Version...Coming Soon"), visit http://www.agenziademanio.it/opencms/it/ValorePaese/camminiepercorsi/. And let me know if you win one of the contracts! (1) This is Mother's Day weekend, and I have been thinking about my mother — the family times, the hard times, the wonderful times. (2) For SNGF this week, write a tribute to your mother. It can be any length. What do you remember about her, and what did you learn from her? (3) Share your tribute or memories in a blog post of your own, in a comment to this post, or on Facebook or other social media. Please leave a comment on this post if you post something elsewhere. 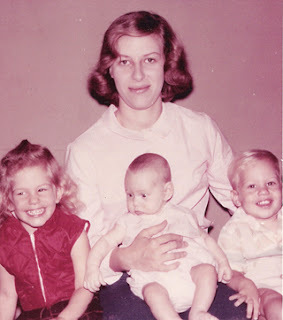 I learned many valuable lessons from my mother. I learned tolerance and openmindedness, because my parents had friends of many different backgrounds — black, Hispanic, Indian, Vietnamese, gay — in a time when that was not common. I learned forgiveness and love, because my mother welcomed my father's first wife and my half-sister into our home, and they lived with us. I learned intellectual curiosity, because my mother always encouraged her children to read, study, and expand their minds. I learned to appreciate language, because she played games with it and made it fun. I learned fearlessness, because she always told me I could do and be anything I wanted. I learned to be adventurous, because she emphasized that we should be willing to try almost anything once. And I learned so much about my family, because she and her mother talked about relatives and let me know who they were. 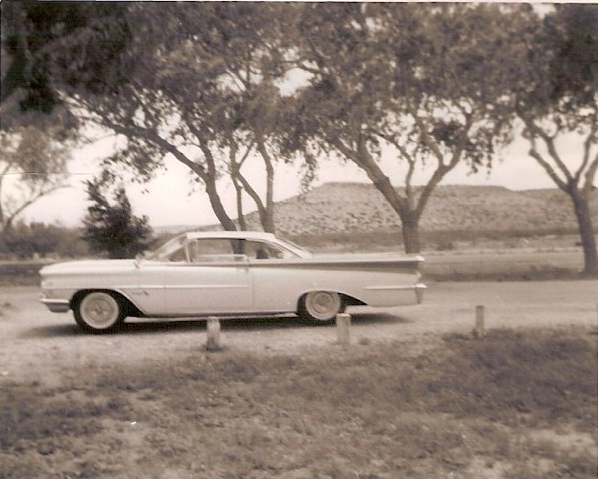 There is no tombstone for my mother with numbers on either side of a dash, because she chose to be cremated. But I don't need a tombstone to remember her. 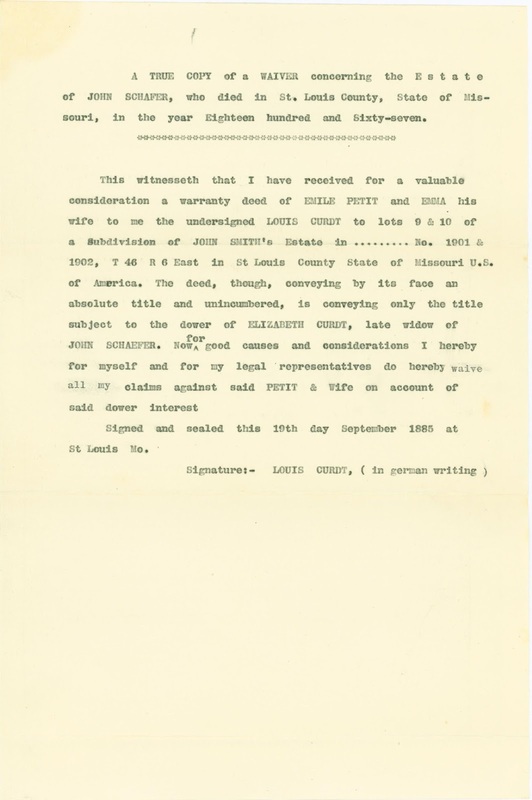 In March, I posted three transcriptions of Louis Curdt's 1885 waiver of dower of Elizabeth (Walz) Curdt. At the time I came up with a couple of ideas for where the original might be. It turns out that I have one and didn't know it. 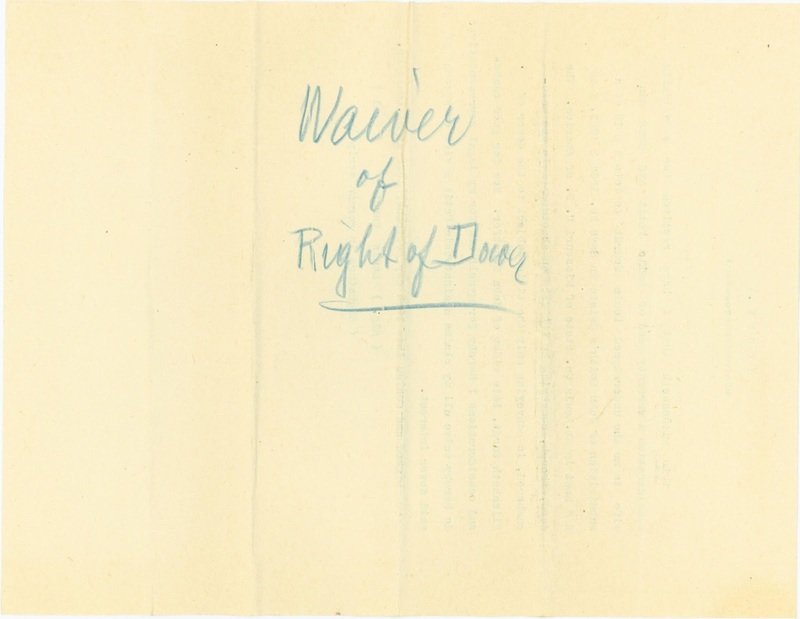 Apparently when I sorted through all the documents, I didn't notice that I had two different sets of these waivers. Well, now I know! This sheet of paper is 7 1/2" x 12 1/2". It's about 20# weight. It has an embossed logo of some sort in the upper left, but I can't read it. (I'm going to scan it at 600 DPI and see if that helps. If not, I'll go for 1200.) The embossing was so strong that it cut through the paper in one place. The sheet has been folded multiple times, in different places. On the main text side, the only ones that seem to be visible in the scan are the two horizontal lines that divide the page into approximate thirds. 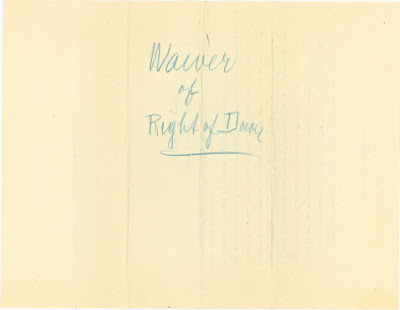 On the reverse side, which has only "Waiver of Dower rights" in blue pencil, the folds framing the text and one that bisects that section can be seen clearly. These are copies of two of the three transcriptions I posted in March. The upper one is the original typed version of the third transcription from March (which now that I have this one in hand I've looked at again, and it is a carbon copy). This sheet also has a "DEPOSIT BOND" watermark and is the same size and color as the March item. The page has two more folds than the carbon copy does. The only difference between the two transcriptions is that the name "Louis" in the signature line is slightly lower in the carbon copy. The name was typed directly with the typewriter. It looks as though the carbon copy name was erased first, but I'm not totally sure. 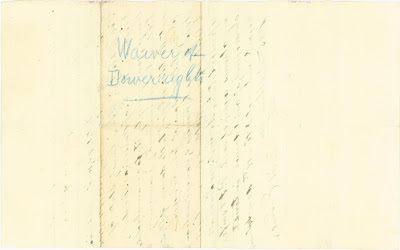 One other difference is that this page has "Waiver of Right of Dower" in blue pencil on the reverse side. The lower image is a carbon copy of the second transcription posted in March. This sheet is the same size, 8 1/2" x 12 1/2", appears to be the same weight and color, and has folds in the same places. 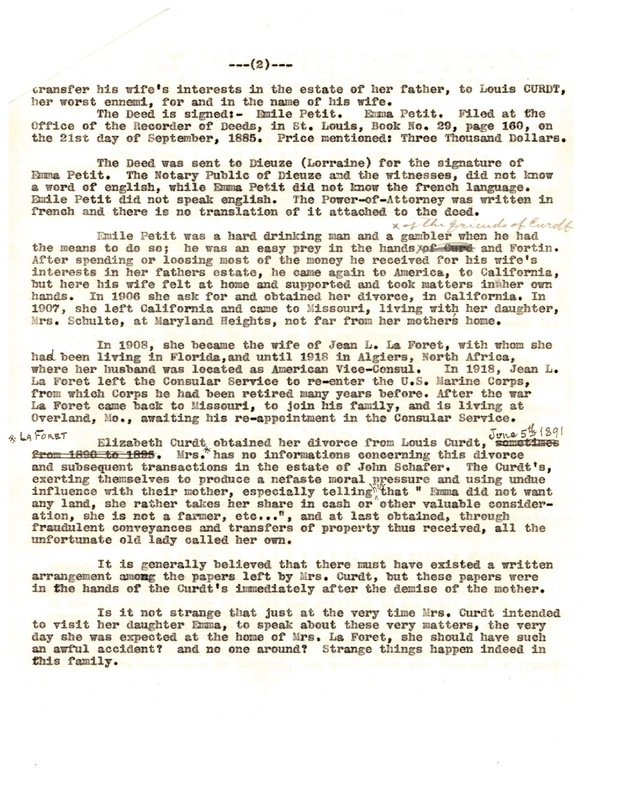 The differences between these two documents are the handwritten word "Sections" in blue pencil on the original typed page (the March copy) and slightly different placement of the words "all my" in the next to last line of the long paragraph. Now that I have the two pages next to each other, I can see that the original typed version had something else typed there that was removed and then "all my" typed in. On the carbon copy, it appears that whatever was typed with the carbon paper was erased and "all my" typed in its place. 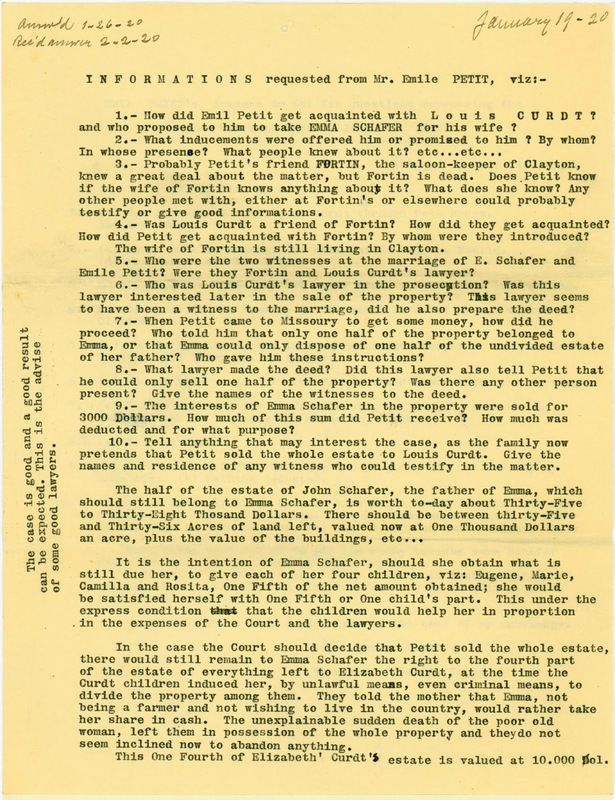 So altogether I have an original handwritten copy of the waiver from Louis Curdt, three typed transcriptions (all differing slightly in wording), and carbon copies of two of the transcriptions. Someone in this family (I'm still guessing Jean) was just a little obsessive about having extra copies. Of course, now that I have a handwritten copy, I just have to transcribe it and compare it to Jean's work. 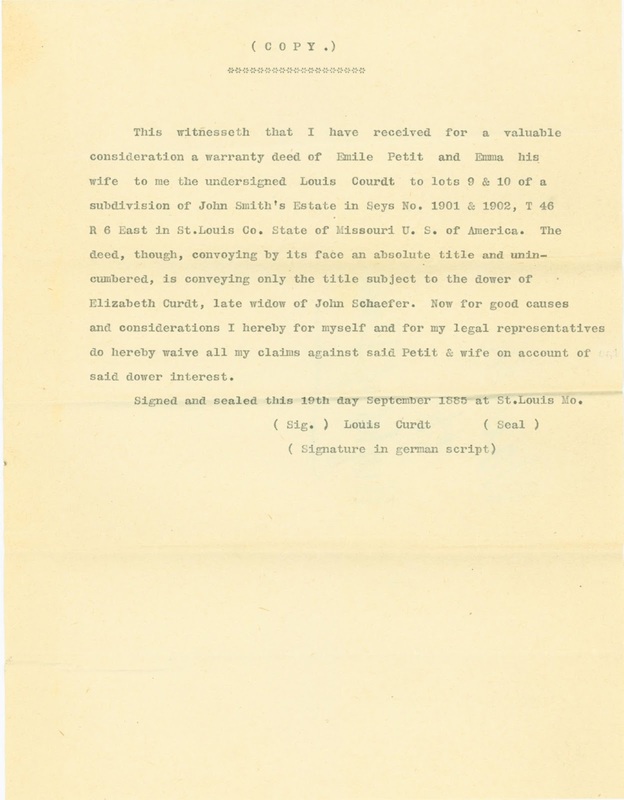 Even though this might be Louis Curdt's original signature (it does seem to be different handwriting from that on the rest of the page, although I don't know if it's "German" script or writing, as Jean typed in his transcriptions), this does not appear to be the original document. The word "seal" surrounded in curlicues suggests that this is a handwritten copy of an original that had a seal on it. Unfortunately, this copy is not dated, so there's no way to tell if it was made around the time of the 1885 waiver or when Elizabeth Curdt died in 1919. At least now we know why Jean had "Seys" in one of his transcriptions — that is certainly what it looks like to me in this original. At first I thought that the "y" didn't look like other "y"s in the document, but then I found a couple that looked at least similar. And if it isn't a y, I have no idea what it could be. Maybe there is yet another "original", which might be more legible. 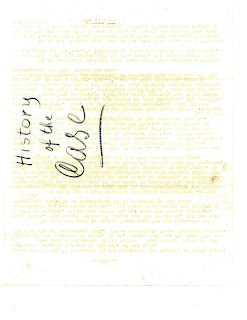 Overall Jean's transcriptions are all very close to the handwritten copy, although he did correct the spelling of "legal" every time. Certainly no significant deviation was made, and the meaning is the same across all three. The only major difference is still Seys versus Sections versus Surveys. Saturday Night Genealogy Fun: I Write Like . . . .
Randy Seaver has found another very . . . interesting challenge for Saturday Night Genealogy Fun. I'm not really sure what I think of this one and the outcome. (1) Find something that you have written that you are really proud of - the best of your work. Do an Edit > Copy of it. (2) Go to the web site http://iwl.me/ and Paste your text into the waiting box. (3) Tell us which famous author you write like. Write it up in your own blog post, in a comment to this blog, or post it on Facebook. 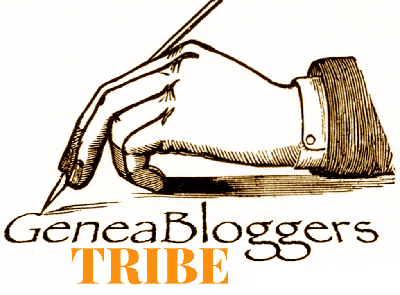 Insert the "badge of honor" in your blog if you can. Sir Arthur Charles Clarke, CBE, FRAS, Sri Lankabhimanya (16 December 1917–19 March 2008), was a British science fiction author, inventor, and futurist, famous for his short stories and novels, among them 2001: A Space Odyssey (1968), and as a host and commentator in the British television series Mysterious World. For many years, Robert A. Heinlein, Isaac Asimov, and Clarke were known as the "Big Three" of science fiction. Clarke immigrated to Sri Lanka in 1956, largely to pursue his interest in scuba diving; that year, he discovered the underwater ruins of the ancient Koneswaram temple in Trincomalee. He lived in Sri Lanka until his death. He was knighted by Queen Elizabeth II in 1998 and was awarded Sri Lanka's highest civil honour, Sri Lankabhimanya, in 2005. I could certainly have done worse! Although I don't think I'll be coming out with the next great riff on 2001 anytime soon. I read the "About" page on the site and found that it works with a list of 50 authors. It doesn't appear to be random chance that got me the same result, but who knows for sure? One minor advantage to the end of this season of Who Do You Think You Are? is that I know no new episodes are coming up, so I'm no longer aiming at a moving target. I finally had some time to sit down and rewatch the Noah Wyle episode for details, so the slow process of catching up continues. The teaser for this episode said that Wyle would hunt for the answers to mysterious family rumors and unearth (like dig up?) a beloved relative who fell from prosperity to poverty, whose desperate measures and tragic downfall would shake Wyle to the core. Wyle was born at Cedars of Lebanon Hospital in Hollywood on June 4, 1971. (The old Cedars of Lebanon Hospital building is now the Church of Scientology, by the way.) His parents are Marjorie Ann Speer and Frank Stephen Wyle (who goes by Stephen). His paternal grandparents, Frank and Edith Wyle, were movers and shakers in Los Angeles. They were close by, so he saw them a lot growing up. His mother is from Kentucky, and they regularly took extended visits to see her family there, and vice versa. 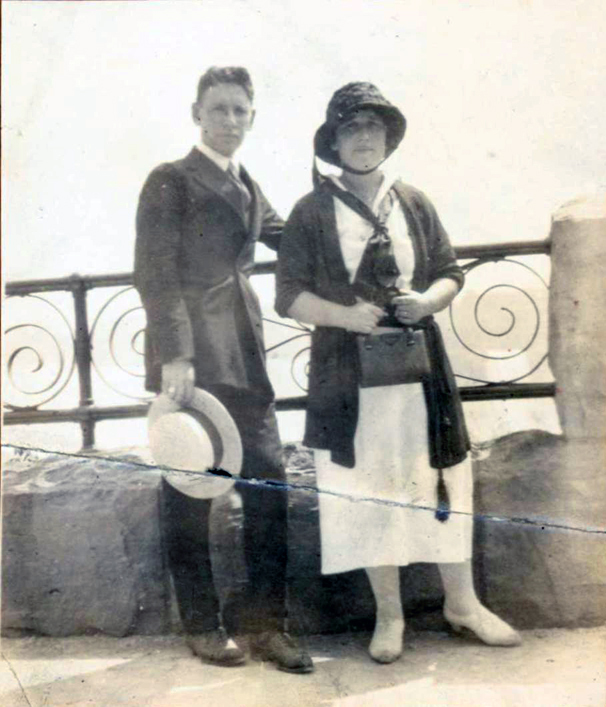 Speer's parents were Alexander Burns Speer and Marjorie Mills (wow, he knows his grandmother's maiden name?). 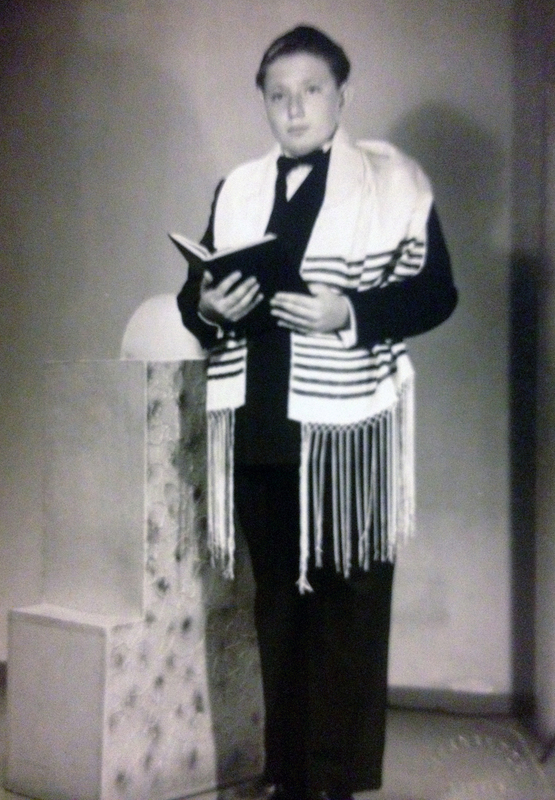 Education was important to Wyle's family in general, but he excelled in history. He saw the inherent drama in studying it. His first interest in history was the American Civil War. 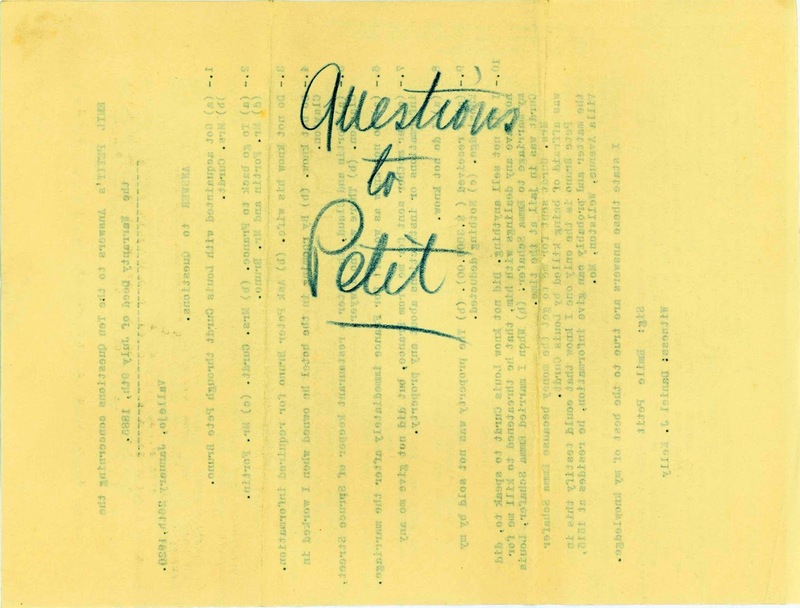 Because his mother's family is from the South, he was always curious about what they might have done in the war. 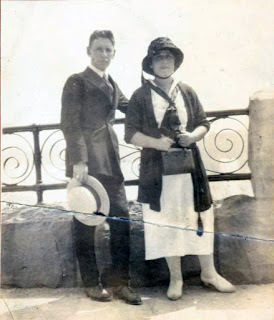 His Uncle Sandy, who was the family genealogist on his mother's side and who passed away at a very young age, had told him it was commonplace for people of means to pay someone else to serve in their place and that their family had taken advantage of that. Wyle had felt disappointed to learn that his family members had skated on an obligation like that. Now that he's 45 years old, Wyle is looking at the second half of his life and decided it's appropriate to understand his family history better. He realizes that people are complicated, and that a noble act doesn't make someone a noble person any more than an egregious act makes him a terrible person. He doesn't want his ancestors to be just "two-dimensional people and fourth-generation anecdotes." He wants to come to an objective understanding of them. (Obviously, he is preparing himself for people who fought on the "wrong side" of the war.) He's curious about his mother's family, and now there are few people to tell him stories, but he wants to understand his history so he can tell his own children. Wyle begins his journey by visiting his mother, Marty, in Hollywood. 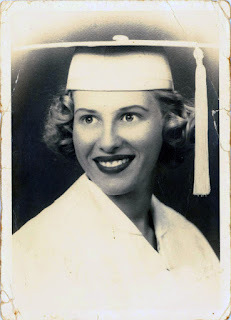 She has found a photograph that Uncle Sandy gave her of her mother's family; Wyle has never seen it before. 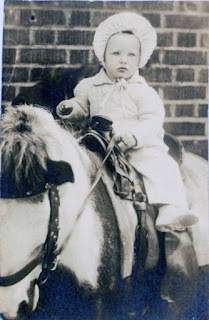 It shows her mother, Marjorie, who was born in 1916, as a baby, so the photo probably dates from around 1917. Marty points out Wyle's great-grandparents, George Pemberton Mills and Margaret Mills. Also in the photo are Wyle's great-great-grandparents, George W. Mills and Marie Pemberton. Marty never knew her great-grandparents, but she knows that the father of George W. (what an unfortuante name) was John Henry Mills, who was born about 1843 in New York. She also knows that he married Mary Emily Brown in 1863 in Summit, Mississippi. We see a floating family tree that follows the direct line to John Henry Mills and adds no information beyond what Marty describes. So they go online to Ancestry. Even though they had just been discussing whether John served in the war, Marty suggests looking in the federal census for 1860 (boy, she knows all the right words, doesn't she?). Wyle types in John Mills as exact, and birth year of 1843 and birth place of New York with exact turned off. 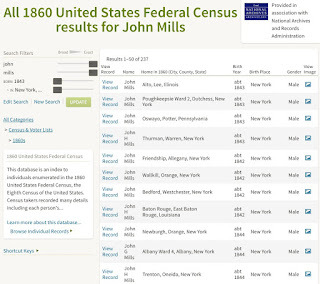 They immediately focus on the John H. Mills living in Baton Rouge, East Baton Rouge Parish, Louisiana and comment that it must be him because of the middle initial — even though his estimated birth year is shown as 1842 and four results above him is a John H. Mills, estimated birth year of 1843, living in Warren County, New York; and three results below the guy in Louisiana is another John H. Mills in New York, this one with an estimated birth year of 1844. Gee, do you think they knew ahead of time what they were looking for? 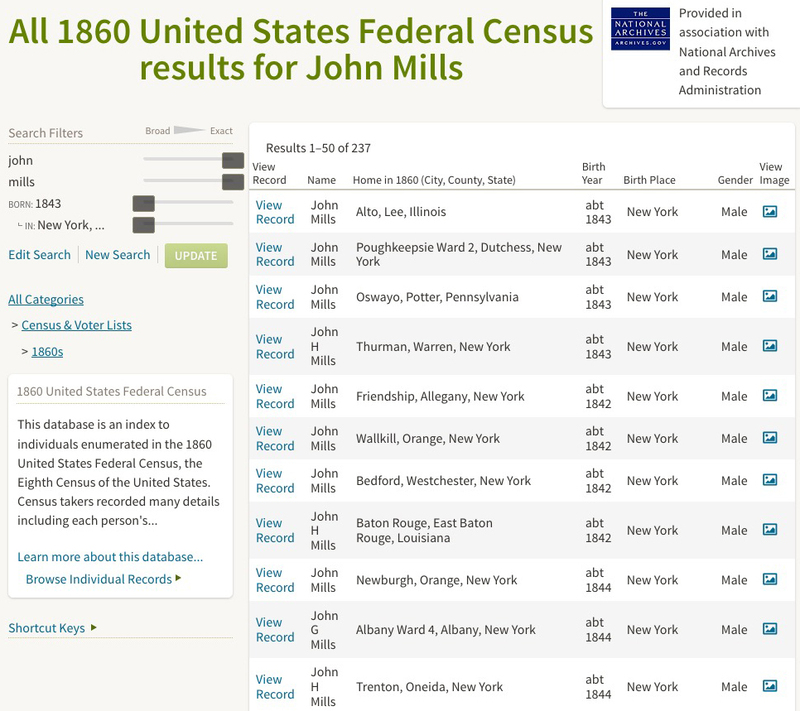 That said, they click on the John Mills in Louisiana. 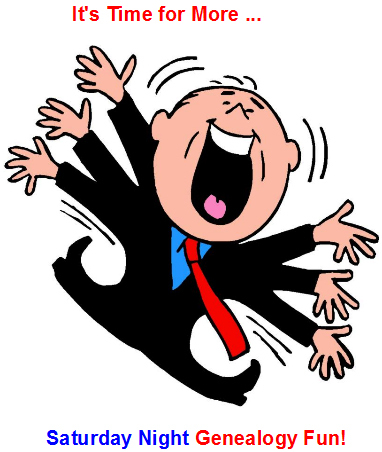 He is the only person in the household, so there is no logical way for them to know he is the correct person, but they are excited nonetheless. His occupation is clerk. 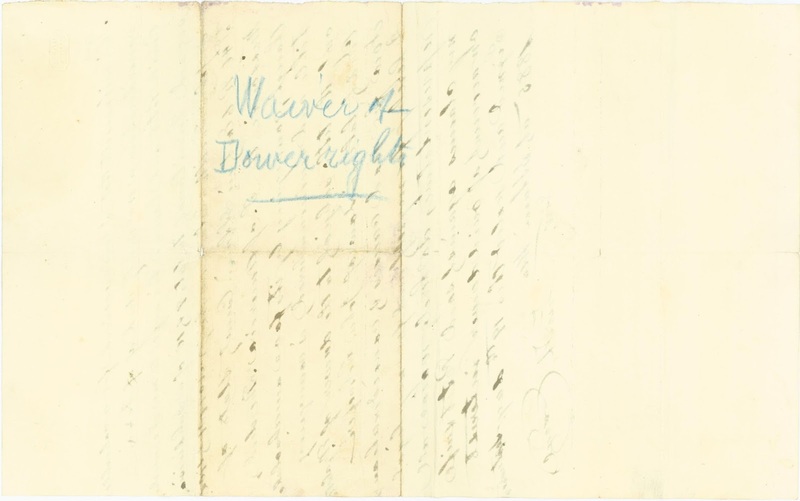 The only muster card shown details that on March 5, 1862, John enlisted in Captain John Knight's Company (Crescent Blues), the Crescent Regiment of the Louisiana Militia, for a 90-day stint. Gordon says that the militia was the home guard. This unit was made up of the elite of New Orleans and was called the "kid glove unit." As a clerk, John was white collar and educated, which surprises Wyle. Gordon explains that in the 1860's, a clerk was indeed in the educated class. And even though John enlisted in New Orleans, there was no discussion of why or when he went there from Baton Rouge. Not really unexpected for a unit of a city's elite, Knight's Company had no experience. Wyle asks if they experienced combat, and Gordon tells him that one month after John's enlistment, the unit was in the Battle of Shiloh, one of the largest, bloodiest conflcts during the war. The narrator steps in to inform us that in 1862, the Confederate and Union forces clashed at Shiloh, Tennessee. More than 40,000 Confederate soldiers, including John Henry Mills, launched a surprise attack on the Union army to try to stop their advance on a railroad junction that granted access to New Orleans, Mobile (Alabama), Memphis, and the Gulf of Mexico. After two days of combat the Union won. There were more than 23,000 casualties, making Shiloh one of the bloodiest battles of the Civil War. So John definitely was in the middle of the fighting. The men in the Crescent Regiment were amateurs, and it would have been a frightening experience for all of them. 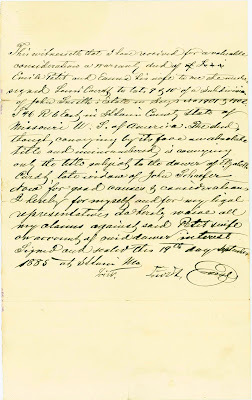 Wyle asks whether this was a voluntary enlistment or if John was forced to sign up. Gordon tells him there was no draft, so he couldn't have been forced. They don't know what motivated him to enlist. Next Wyle asks why John, who was born in New York, was in Louisiana at all. Gordon admits she doesn't know how long he was there. (Doesn't Baton Rouge have any surviving city directories, tax lists, or newspapers to help pin that down? I know New Orleans does.) She points out that New Orleans was the center of the slave trade, so there's a good chance that John's work was in some way tied to that. Many men joined up to support the economy that provided their jobs. And after his 90-day enlistment, John was finished with the army. (Except that if you look at the third muster card in John's packet, which is the fourth image above, it says that John was "Transferred from the Crescent [Regiment] to the 18th for war", presumably meaning the duration of the war, and the top of the card shows that John was in Company F of the 18th Regiment. The asterisked footnotes on the second and third muster cards explain a little about the relationship between the Crescent Regiment and the 18th Regiment. 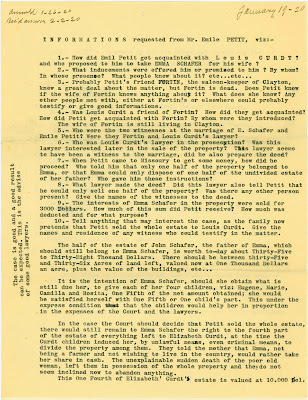 Perhaps Gordon discussed this with Wyle in footage that did not make it on air, but I looked through the records of the Louisiana 18th and those of the Reconsolidated Crescent available on Fold3 and did not find John H. Mills. The only records I found for him were the ones I've included above. 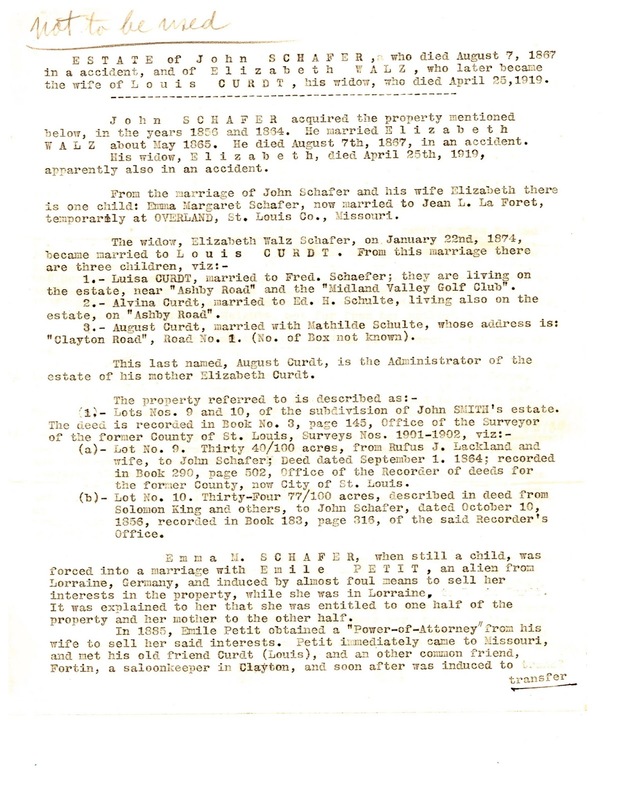 So I don't know if there are no records of John's service in the 18th/Reconsolidated Crescent, there are records but they aren't on Fold3, he didn't actually serve after August 1862 [which was already about 90 days past his original 90-day enlistment], or some other scenario. And this question will come up again near the end of the episode.) Wyle still thinks it's cool to find out that John enlisted and fought at Shiloh, which is the opposite of what his family (to be specific, Uncle Sandy) had said, that he had paid someone to fight in his place. As he leaves the archive, Wyle comments on how enlighteniing this has been, even though his head has been spun around by the misconceptions he had. It appears that there is now a cold trail for John's military history. He doesn't know much about John beyond broad strokes and a few facts, but he wants to know who John really was. Even though Gordon told Wyle that Summit, Mississippi is where he should go, somehow Wyle takes a wrong turn and ends up in Jackson (about 77 miles away), so one of the show's producers must have redirected him along the way. Wyle muses that he would love to find a photograph of John or a letter from him, something to give him a three-dimensional, tactile connection. He has called his children to update them on what he has learned, and they are following him on his journey. They think it's pretty cool (but do they really understand the implications of John having fought for the Confederacy?). Wyle continues to rationalize John's enlistment: Who knows what motivated him? It could have been his buddies, politics, economic interests, wife-to-be. He's finding it fun to try to fill in the blanks. Maybe he'll find something to steer things in a specific direction. 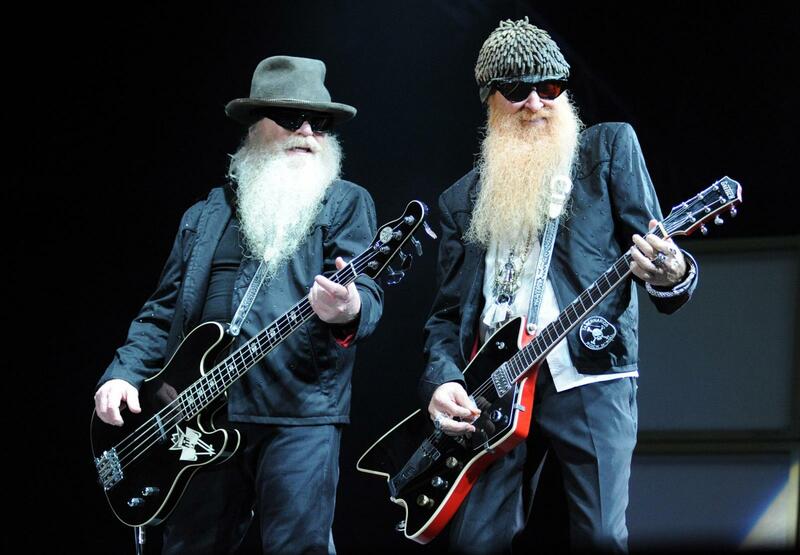 After overcoming his initial surprise, Wyle comments that John doesn't look anything as he expected him to and jokes that he could play bass for ZZ Top, which even makes Murphy laugh. Murphy apologizes that the photograph is undated and that she doesn't know when it was taken, but Wyle doesn't seem particularly disappointed. He finds John's high forehead similar to his grandfather's and can kind of see his face in the photo. Capt. 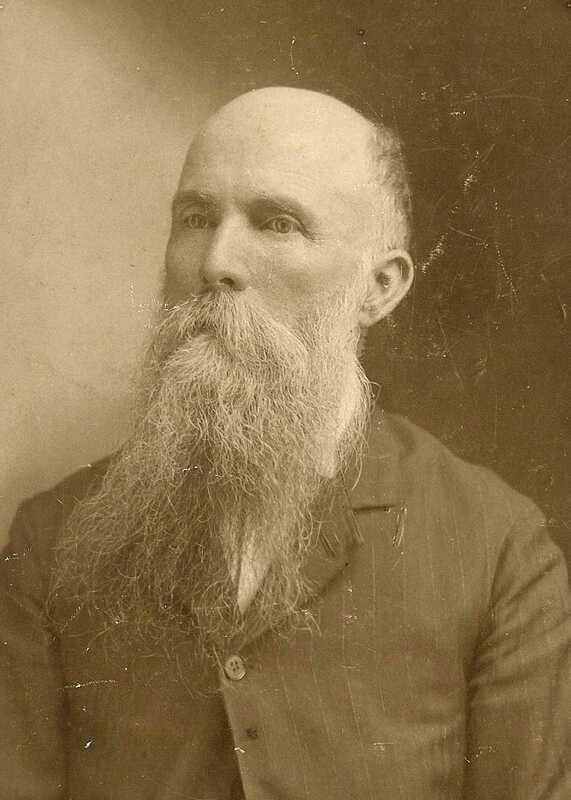 J. H. Mills, after twenty-four years occupancy of the city treasuryship, was again unanimously elected by the city council at its last meeting. This action of the mayor and council in again honoring this faithful and impartial officer meets the approval of every citizen of our town. Twenty-four years is a long time and that anyone could so continuously retain the high regard and esteem in which our treasurer is held, speaks more than words can convey of his high character and popularity. His long continuance as treasurer, undoubtedly exceeds that of any other officer occupying a similar position in the state. Wyle is happy to read this glowing description of his ancestor, who was obviously well respected and an upstanding member of society. He subtracts the years and figures out that John must have begun his tenure as treasurer in 1875. He notices that John retained the rank of captain, but Murphy says it was probably an honorary title and that there was no evidence John was promoted from private. As city treasurer, John must have been fiscally responsible, and Wyle wonders what level of society that would have equated to. Was it high-end civil service, or maybe the town elite? Murphy says it would have been town elite within the local community. John was a prominent, important citizen of Summit. Because he had a premium on a large life insurance policy falling due Monday, and could not raise the funds to pay it, and being otherwise financially embarrassed Capt. 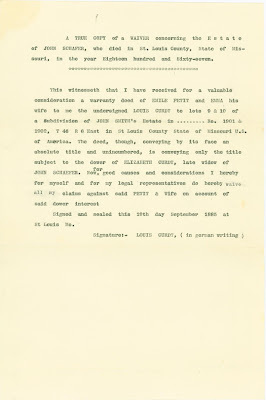 John H. Mills, and [sic] old and prominent citizen of Summit, Pike county, committed suicide at the Larence House in Jackson shortly before midnight Saturday night. The body was found a few hours later by a police captain from New Orleans with the head laying on a bloodsoaked pillow and a 38-calibre revolver still clasped in his right hand. It seems Capt. 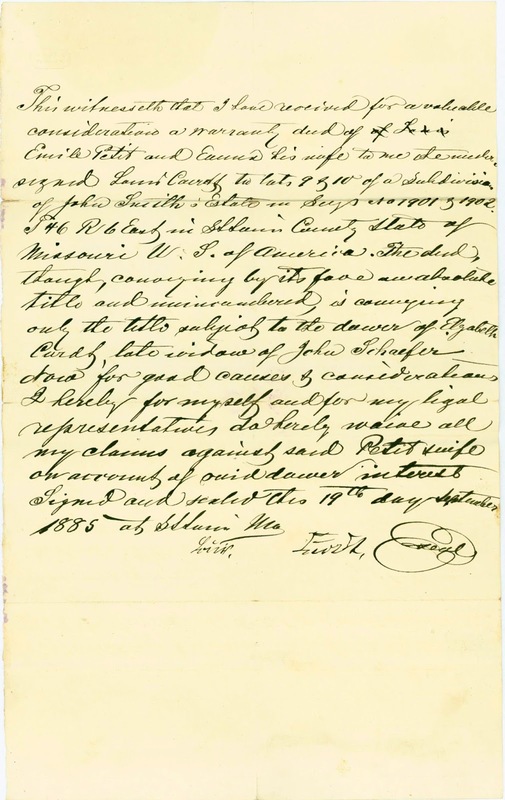 Mills went to Jackson for the purpose of killing himself, and it is evident that he had been contemplating the deed for several days, but did not desire to commit it at home. Preparations were made with the utmost coolness and deliberation. He went to his room shortly before nine o'clock carrying with him a supply of writing paper and envelopes. 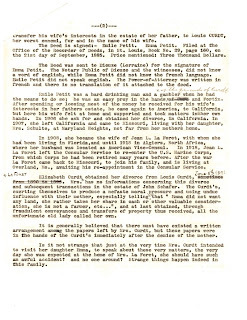 Five letters were written and addressed, three of them being sealed and [directed to friends and relatives at his hold (sic) home. The other two explained the cause of the deed. 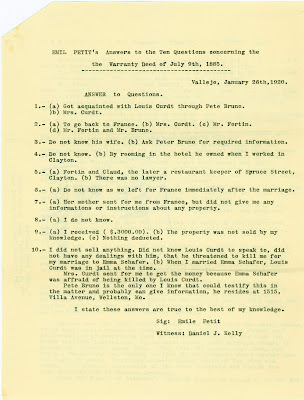 It is evident that Mr. Mills expected to have his deed discovered immediately, for he left the door of his room open and the gas jet burning. The body was not discovered, however, until several hours later, when Capt. Fitzgerald, of the New Orleans police force, who was in the city to attend a Knights of Columbus meeting, was passing by the door and remarked to a friend that the man in bed looked like he was dead. The friend ridiculed the idea, but Capt. Fitzgerald was struck by the unusual pallor of the man's face, insisted on making an investigation that confirmed his suspicions. Mr. McQuaid, one of the proprietors, was immediately notified. He stated at the coroner's inquest Sunday morning that he had heard a pistol shot a few minutes after 11 o'clock, but that it] sounded like it was two or three blocks away, and paid no attention to it. "With a premium coming due on a large life insurance policy in the Equitable tomorrow which I cannot meet, and being financially embarrassed beyond hope of immediate retrieve, I resolved to take my own life in order to protect my family and personal friends who have endorsed my paper. I am sure that my family will see that my personal friends and endorsers are not made to assume my obligations. I left home to end my life because I could not bear the thought of committing the deed under my dear loved ones' eyes. "May God, who rules the universe, forgive as far as possible, my act. The letter was written in a bold, firm hand, and the preparations for the rash act were evidently not fraught with nervousness. 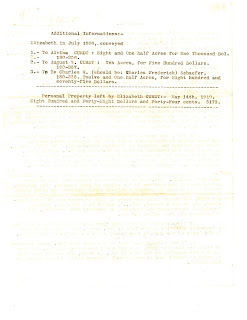 Side by side with this letter was the following addressed to [Messrs. McQuaide and Ewing, proprietors of the Lawrence House. 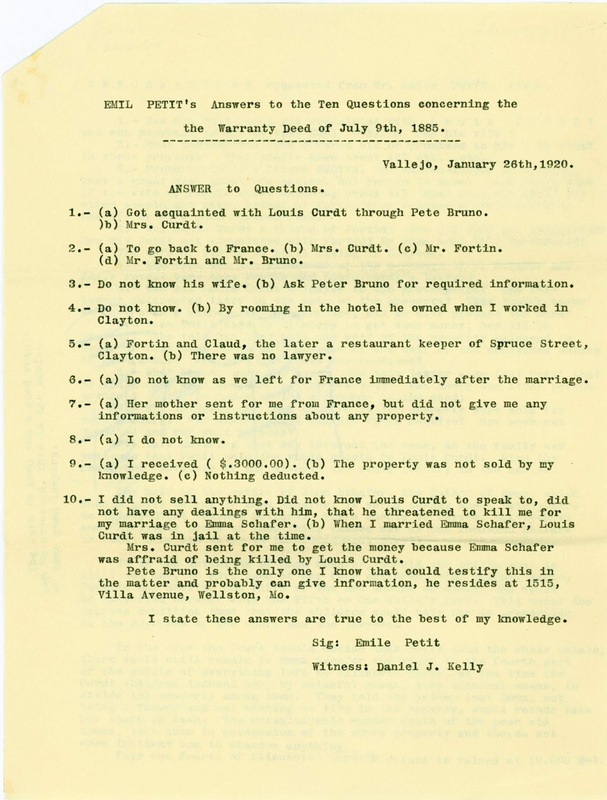 "Wire Dr. W. W. Moore, Summit, Miss., to break the news to my dear] wife and daughter. Ask Mr. John Patton or Judge R. H. Thompson to have the undertaker embalm my body and ship to Summit. "God knows I hope you will not think too hard of me for what I have committed in your house. 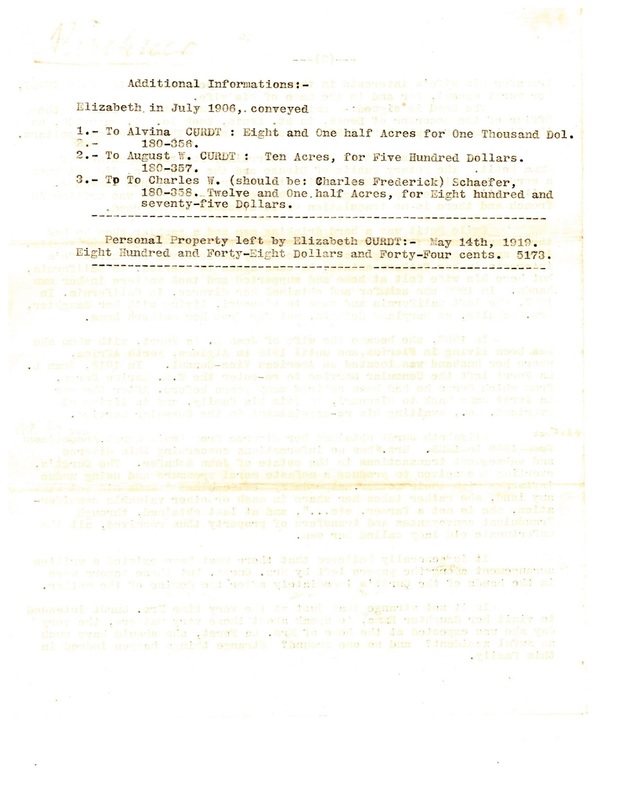 The other letters were addressed to Mrs. M. E. Mills, Summit, his wife; Mr. E. H. Mills, Summit, his son; Dr. W. W. Moore, Summit, the family physi[cian. The missives were not opened but probably contained farewell messages and directions concerning the disposal of his personal affairs. [beginning of paragraph not shown] believed his financial troubles were more imaginary than real, for had he made known his troubles to his warm and life-long friends they would gladly have extended the necessary aid. Capt. Mills was a brave, fearless and faithful Confederate soldier, having entered the ranks in New Orleans the first of the war, and serving till its close, when he settled in Summit, and resided here continuously until his deplorable end. At the time of his death he was adjutant of Stockdale Camp, 324, U. O. V., of Pike county, and had issued a call for the Camp to meet at Magnolia to-morrow, but never again on earth will he answer to the roll call of his comrades-in-arms. He was also an esteemed and beloved member [—]nit[?] Lodge, No. 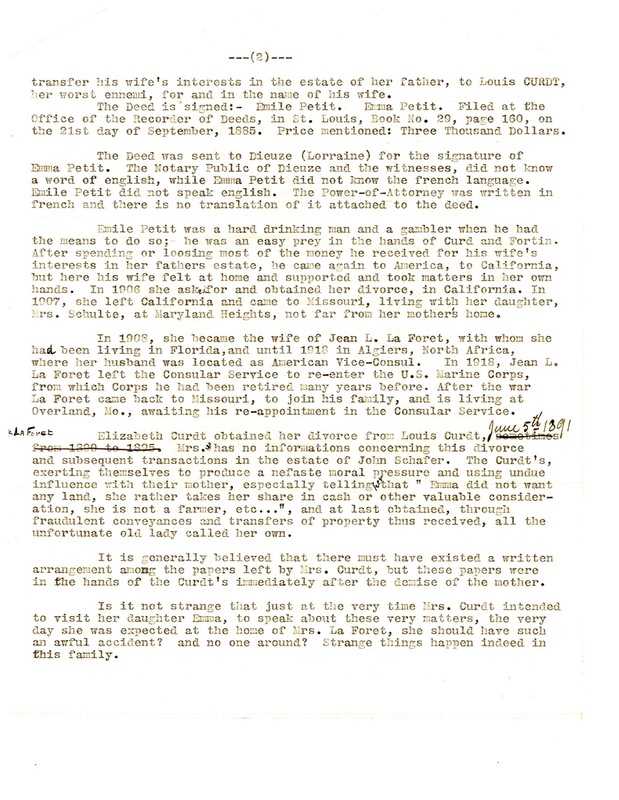 93, I. O. O. F.; DeLeon Lodge, No. 40, K. of P.; Woodmen of the World and Knights of Honor, in all of which he stood deservedly high. [beginning of paragraph not shown] to his many friends here, but every where he was known, all of whom deplore his death beyond words to express, and regret that he labored under the hallucination that it was necessary his life should pay the forfeit of his financial obligations. In his death a good man has gone, and one the whole town will sadly miss. Wyle's reaction to all of this? "Holy moley!" This was definitely not what he had expected. Even though the obituary/article said John was "about sixty-five years of age", Wyle figures he was about 61, based on his birth year of 1843. Wyle notes the comment about "formerly wealthy" and asks about the business reverses that were mentioned; Murphy says she is not sure but that Summit had been in decline since the 1880's. John had probably invested in several opportunities, with each failing, a scenario not uncommon in the South. Wyle wants to know what happened to John's family. With his suicide, it sounds as though there would no inheritance. 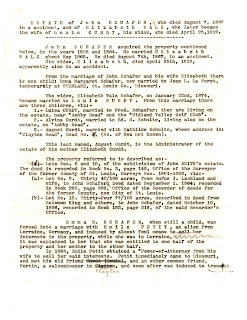 Murphy explains that the life insurance policy John had mentioned in his letters was probably a deferred dividend policy. Companies would bring groups of people together for 15 to 20 years; if an individual lapsed in his payments, he received only a small value, but the survivors at the end of the investment period split all the premiums and dividends. Wyle thinks it sounds "very pyramidy", and Murphy agrees. If someone was unable to pay a premium, he lost everything he had invested. On the positive side, if the policy had been held for at least one year, it was not contested for any reason, paying out even in the event of a suicide. So the policy would have brought money to John's family, and they would have been able to pay some debts and perhaps have something for the widow's share. Wyle is awed to think about how horrible it would have been for John to keep up appearances while he made all these plans, to maintain a veneer of normalcy. Until now, Wyle has always thought of suicide as a cowardly act. He is trying to reconcile his previous opinion with what looks like a selfless act on the part of John. John's friends and family would certainly have said it was an unnecessary act. Murphy says that a year after John's death, Congress began to investigate these insurance policies, and eventually they were banned. 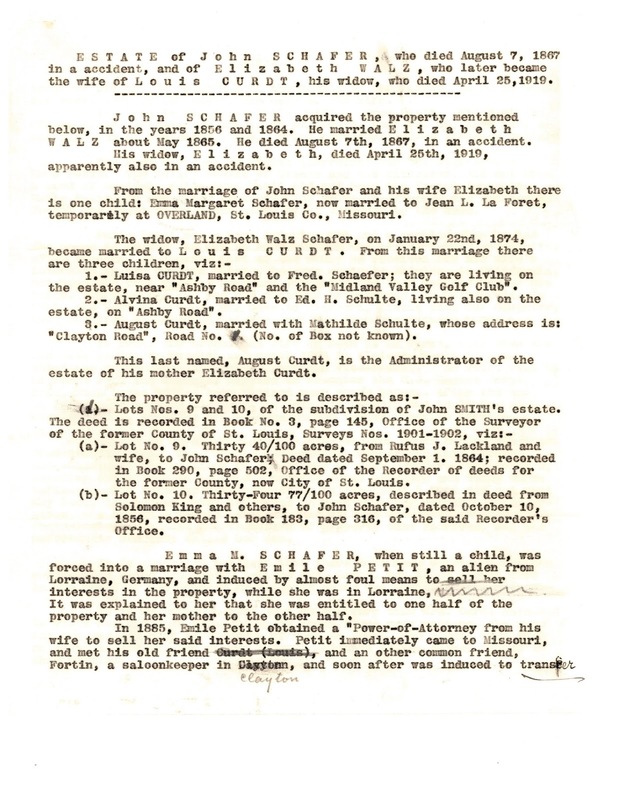 What happened to John's wife? 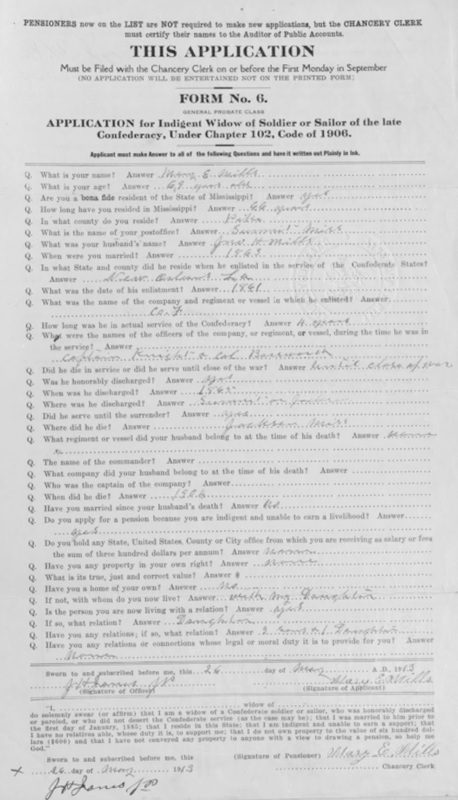 Murphy found Mary on the Confederate pension rolls in 1913 as a widow. To qualify for one of these pensions, you had to prove you were truly poor. The listing is by county, and Mary E. Mills appears under Pike County. Wyle notes that this was nine years after John's death and asks how much money she received. The summary Murphy has shows that she was getting $40.30 for the year, well below poverty level. Mary was destitute. Murphy says that this was the only public aid available, however. 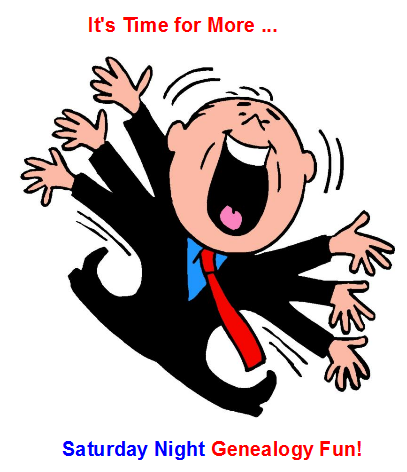 Mary had had some property and had been selling it to pay debts, some of which were from John. Wyle realizes that John and Mary's children were adults by this time and wonders why they didn't take care of Mary or support her (even though the quick glance at the papers Murphy had indicated that Mary was living with her daughter, Carrie). Murphy brings up the question of what their circumstances might have been. They could have been helping to pay off their father's debts. Wyle notes the irony in the situation and compares it to an O. Henry ending, where the opposite of what was planned happens. John had committed suicide to make sure his family received the insurance money, but the family was in debt anyway. 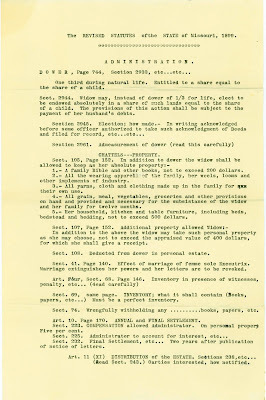 The pension rolls are not available online, but some of the pension applications are (at the Mississippi Department of Archives and History, in fact, the very place Wyle and Murphy are sitting). 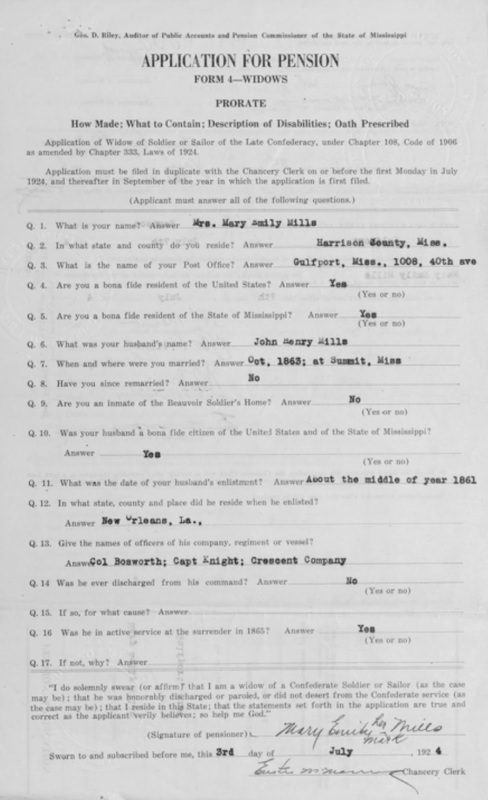 I was able to find Mary's applications from 1913, 1924, and 1926. 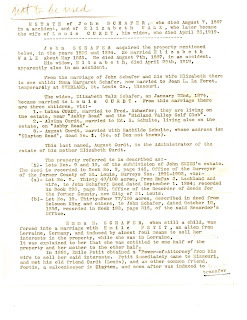 Mary is pretty consistent in the information she gives — John enlistedi n 1861 (it was actually 1862); she and John were married in 1863 (one application has the full date); John served through the end of the war, with accurate information about his unit. I find it odd that she signed the applications in 1913 and 1926, but the one for 1924 has "her mark." I wonder who really filled out each of the applications. As Wyle leaves the archive, he talks about his great-great-great-grandfather's suicide and tragic end. The obituary really affected him emotionally. The public outpouring of emotion, the tolling of the church bells, showed that John was really beloved. Now Wyle wants to find out what happened to Mary, who lived many years longer and who moved from Pike County to Harrison County. Wyle goes next to Biloxi, Mississippi. 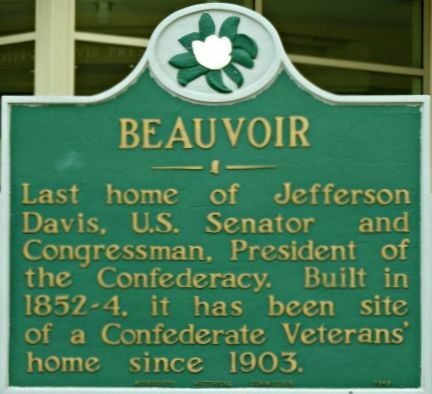 He tells us that he is going to the Jefferson Davis Memorial Library, but the Beauvoir historic marker doesn't actually include those words, so it was a little confusing. The marker says that the home "has been" "a Confederate Veterans' home since 1903." 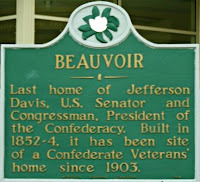 The Wikipedia pages for Beauvoir (the house) and the library make clear that the house became the library after the last Confederate veteran living in Mississippi died, which was in 1953. You'd think someone might have updated the sign by now. Inside, presumably in the library, Wyle meets Dr. Susannah Ural, a military historian from the University of Southern Mississippi. 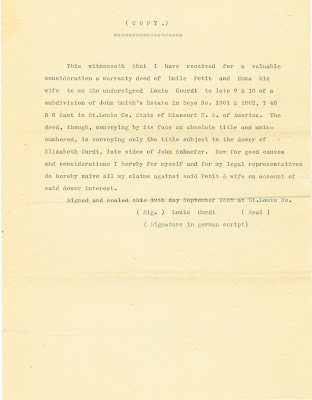 She hands him a file and tells him that it has copies of what she has found. The first item shown is minutes from a September meeting during which an application for emergency care for Mary Mills was approved, in a handwritten note added to the typed minutes. The finance committee of the Board of Directors met at the Home on Sept. 14th with Mr. J. H. Mc Gehee and Mrs. Josie C. Rankin present. The accounts for August were audited and allowed. 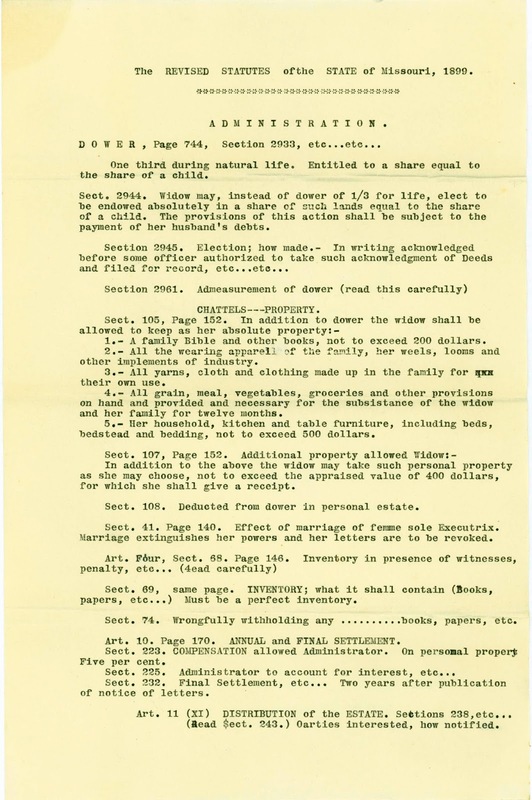 The following applications were approved: Mrs. M. A. Jackson, McComb, Pike Co.; Mr. and Mrs. Horace Walker; Biloxi, Harrison Co.; W. C. Green, Louin, Jasper Co.; Wm. 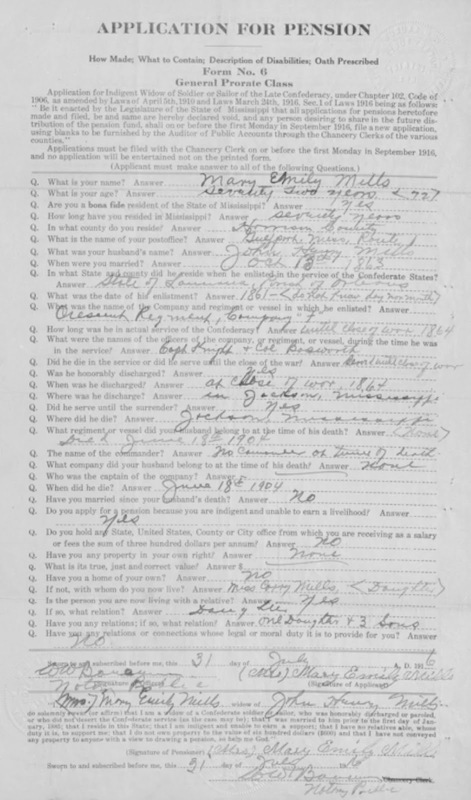 T. Waldrup, Batesville, Panola Co.
[handwritten note] Mrs. Mary Emily Mills, of Gulfport, Harrison Co., application was approved during vacation on Sept. 10th by Mr. J. H. McGehee, same being an emergency case. So what was the emergency? Ural doesn't know, but it could have been medical care, as the home had a hospital on site. Before coming to the home, Mary was living with her daughter, Carrie. Maybe Carrie was no longer able to take care of her mother. Ural says that these applications usually came when the family needed help, either temporary or permanent, in caring for their relatives. Wyle compares Beauvoir to a home for the aged, and Ural agrees, but adds that the residents were impoverished. Mrs. M. E. Mills died last night at 9 o'clock, at Beauvoir Soldiers Home at the age of 84 years. Mrs. Mills is the widow of the late J. H. Mills, a Confederate veteran who preceded her to the grave a number of years ago. She was a Miss Brown born in Fort Gaines, Ga., but has resided in Mississippi for many years, living in Summit when the famiy was one of the best known in that section. She moved to Gulfport from Summit 14 years ago with her daughter, Miss Carrie Mills. Mrs. Mills was a gentlewoman of the old school and in her younger years her home was rendezvous of the intellectual and social group of her neighborhood. She was of a noble Christian character, a communicant of the Episcopal church. 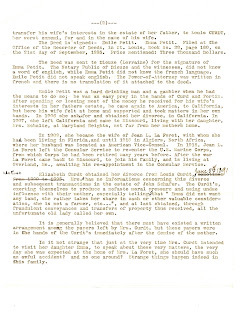 She is survived by one daughter, Miss Carrie Mills, of Gulfport, and three sons, E. H. Wills [sic] of Shreveport, who will arrive in Gulfport this afternoon, G. W. Mills of Lexington, Ky., and H. C. Mills of Brookhaven. The remains are at the Riemann Funeral Home on 25th avenue and will be shipped tomorrow morning to Summit, Miss., for burial. Wyle notices the misspelling of the first son's surname, which Ural confirms was a typo by the newspaper. He latches onto the description of Mary as intellectual and social and comments that she was educated and progressive for the era. Ural corrects him, explaining that Mary was educated to be conversational, not professional, and that she did appear to enjoy that. She was represntative of wealthy women of that time. Wyle is still happy and finds the obituary informative. Mary has nowtaken on some tangible qualities for him. Marty comes out to Mississippi to see Wyle and share in the discoveries. He tells her that he was happy to learn that their ancestor did serve in the Civil War, right or wrong. He shows her the photograph of John and talks about how he is reconsidering his opinion of suicide, and also shares the photo of Mary. He closes by saying that it's been quite a week and that you can find whatever you're looking for — good or bad, hero or villain. The complexity of the past is wonderful.